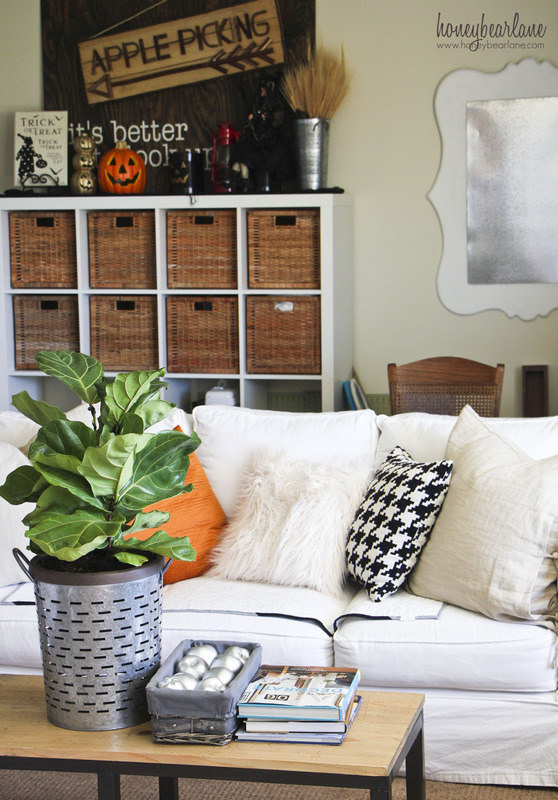 Fiddle Leaf Figs are my favorite house plants and pretty much the favorite of designers everywhere. 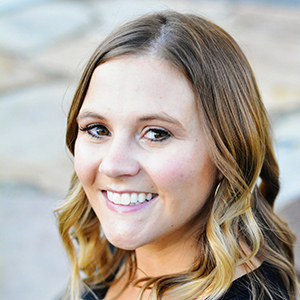 They are a hot commodity and it’s easy to see why, they are gorgeous! They have the most beautiful and full form, filling dead corners and spaces to bring life, color, and height to any room. 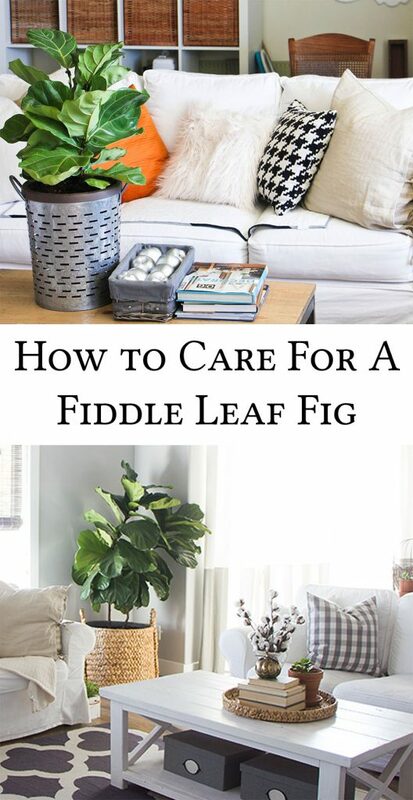 Caring for a fiddle leaf fig can be tricky for some people, so here are my tips. 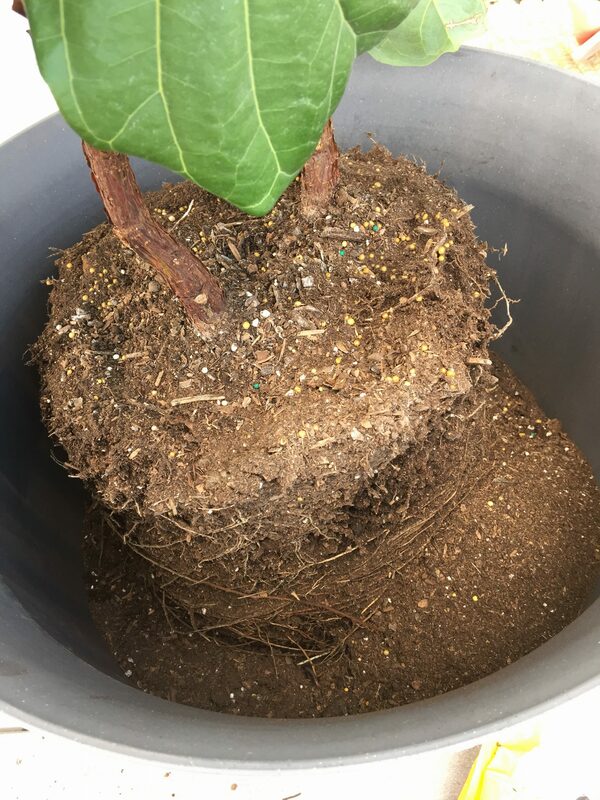 My FLF started as a wee baby and in a smaller pot. See how cute and little it is here? I’d already had it awhile in the picture actually. As it grew, I knew it would need a larger pot. When we moved, I transplanted it again into a larger pot I had and now it’s this size. I found the largest woven basket I could find; I found it at Home Goods for about $50. 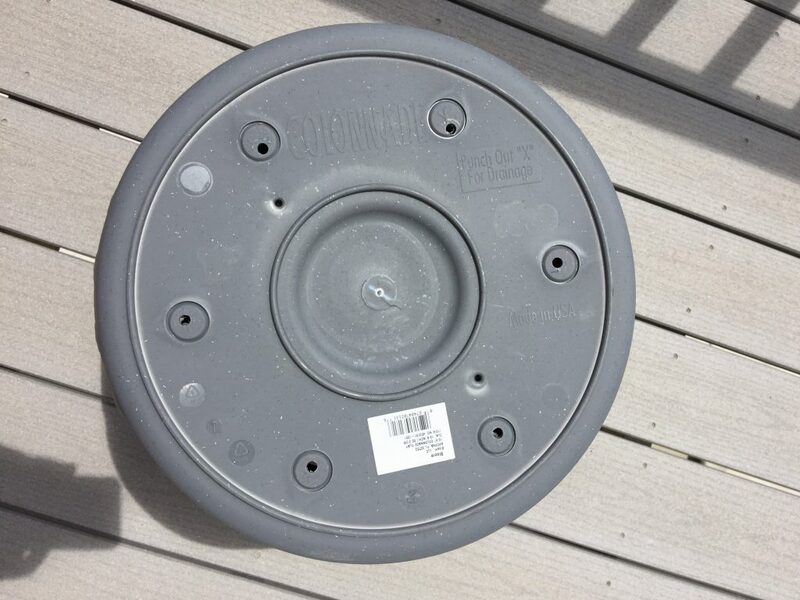 Then I found a plastic planter at Walmart that was about the same size. Any smaller and it wouldn’t be much bigger than the last pot. 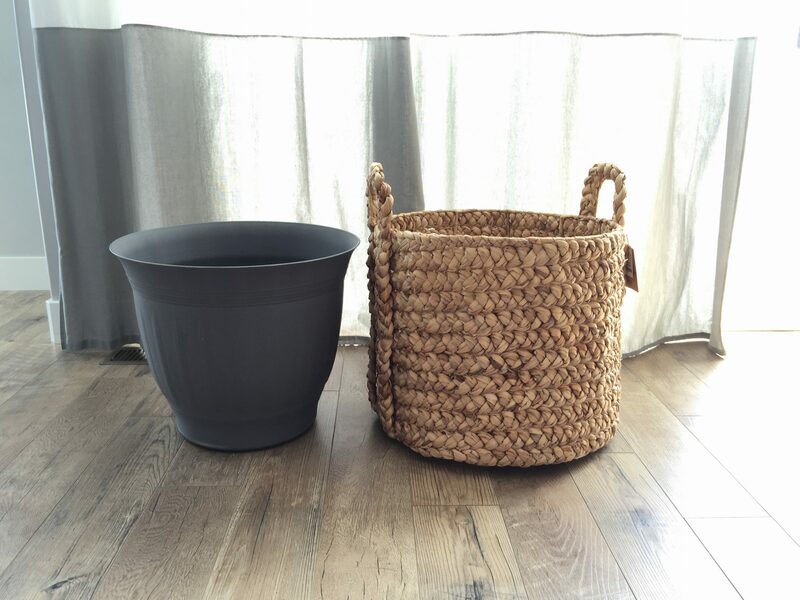 You can’t just stick this pot into the basket though because it will destroy the bottom of the basket with the water drainage. 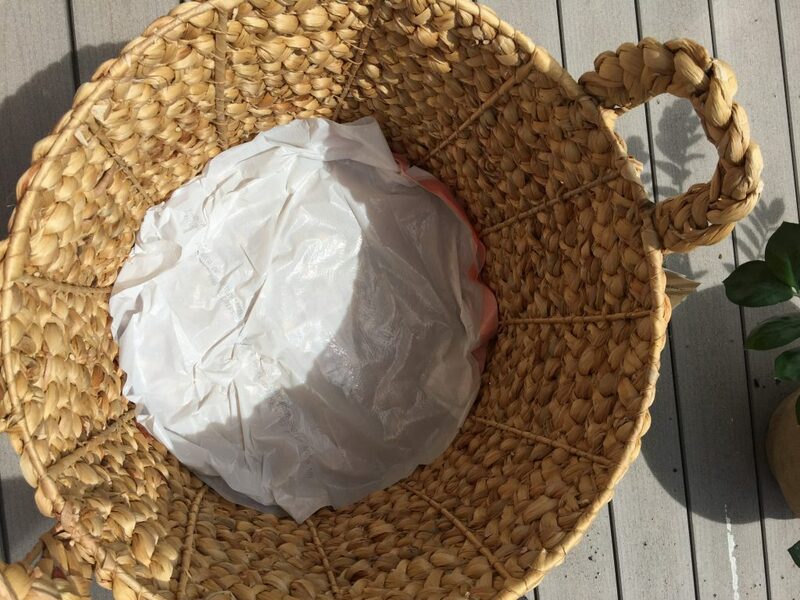 I lined the bottom of the basket with a trash bag. There’s a lot of dirt so it’s not very often that water will run out but this will protect it when it does. Water it but not too much: I give it about 1-2 cups every few days, sometimes only once a week. I think the classic mistake a lot of people make with their houseplants is watering either not enough or too much. Surprisingly a lot of people water too much! They don’t need as much moisture as you might think. If you’re unsure about if your plant needs water or not, stick your finger in the soil fairly deep and see if it feels wet. If it’s too dry, it needs water. Indirect Sunlight: My FLF lives in the corner of my family room where it gets tons of indirect sunlight. It’s next to a large window but protected by two walls. If it were to get a lot of direct sunlight, it would probably get scorched and die. It gets a few hours a day of direct sunlight but not enough to be a problem. Fertilize: I have this fertilizer I like called Osmocote and I add a scoop of it in the spring and another scoop halfway through the summer to keep it growing. I could possibly add more but I keep forgetting. Plants go into hibernation in the winter so you don’t want to fertilize then. Dust the leaves: I don’t do this that much but when I do, it looks even prettier. It’s actually really helpful to keep the leaves from getting bacteria on it and able to photosynthesize better. That’s it! Seems like a long list but honestly it’s super easy. I only think about it every once in awhile when I need to water it or whatever. The rest of the time I just admire how beautiful it is and how proud of it I am. 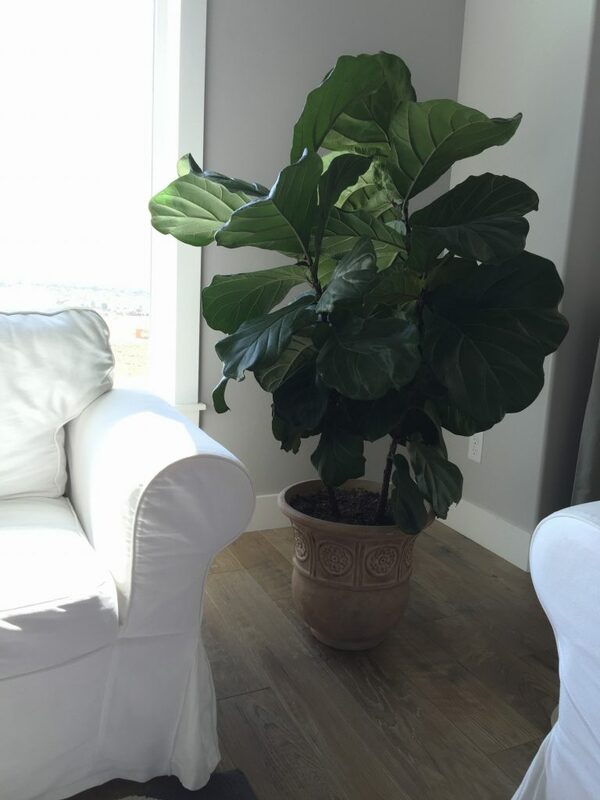 Mature Fiddle Leaf Fig trees cost hundreds of dollars! So buy yourself a baby and raise it into an adult. Hello there, I discovered your blog by the use of Google whilst searching for a similar subject, your website came up, it appears great. via Google, and located that it’s truly informative. I’m gonna be careful for brussels.